Obsessed with answers, we have lost sight of the power and value of questions. Debates over globalization, climate change, health care, and poverty will not be “solved” with simple answers, but that’s what Americans are being trained to expect. Andrea Batista Schlesinger argues that we’re besieged by cultural forces that urge us to avoid critical thinking and independent analysis. The media reduces politics to a spectator sport, standardized tests teach students to fill in the dots instead of opening their minds, and even the Internet promotes habits that discourage looking deeper. But the situation isn’t hopeless. 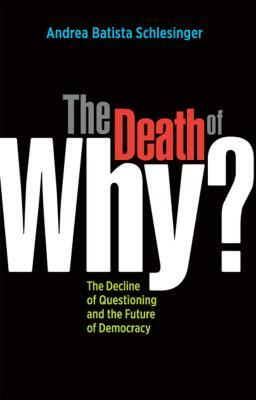 Schlesinger profiles individuals and institutions renewing the practice of inquiry—particularly in America’s youth—at a time when our society demands such activity from us all. Our resilience will depend on our ability to struggle with what we don’t know, to live and think outside comfortable bubbles of sameness, and, ultimately, to ask questions. Since 2002, Andrea Batista Schlesinger has applied her background in public policy, politics, and communications to lead the effort to turn the Drum Major Institute, originally founded by an advisor to Rev. Dr. Martin Luther King Jr. during the civil rights movement, into a progressive policy institute with national impact. During Andrea’s tenure as executive director, DMI has released several important policy papers to national audiences; created its Marketplace of Ideas series, which highlights successful progressive policies from across the country; launched two policy blogs that reach several thousand readers each day; and launched a national program to foster careers in policy for college students from underrepresented communities. In 2009, Andrea took a leave of absence from DMI to serve as a senior policy advisor to the re-election campaign of New York City mayor Michael R. Bloomberg. Andrea studied public policy at the University of Chicago. Before joining DMI, she directed a national Pew Charitable Trusts campaign to engage college students in discussion about the future of Social Security and served as the education advisor to Bronx borough president and mayoral candidate Fernando Ferrer. She has been profiled in the New York Tmes, The New Yorker, and Latina magazine, and in Hear Us Now, an award-winning documentary about her tenure as the student member of New York City’s Board of Education. In media outlets from National Public Radio to the Huffington Post, Andrea is turned to for her forward-thinking analysis on America’s greatest challenges. She has appeared on television shows such as CNN’s Lou Dobbs Tonight, and her writing has appeared in various publications, including The Nation, Newsday, the Chicago Sun-Times, the Mississippi Sun Herald, the New York Daily News, Alternet.com, TomPaine.com, the New York Sun, Colorlines magazine, the Chief-Leader, and City Limits magazine. Andrea was named a Forty Under 40 Rising Star by Crain’s New York Business. She serves on the editorial board of The Nation. She grew up in Brooklyn and lives in Queens.